Once again I put my comics students through the obstruction exercise - inspired by Lars Von Trier's film The Five Obstructions, I had students re-draw a comic of theirs with some restriction specific to them. These included not using panel borders, using different materials than they normally do and limiting dialogue or text. I felt it would be only fair that they be able to give me obstructions as well. 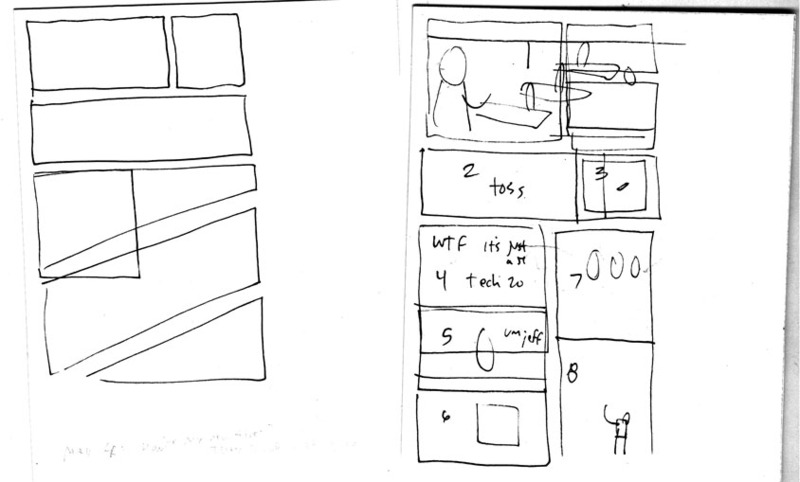 They chose to have me draw with a panel layout that wasn't a grid, use animals not people, use pastels and draw it big. They also tried to get me to draw more cars but I nixed that one. 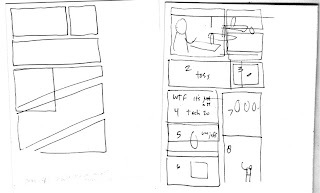 I chose to redraw this two page sequence from Funny Misshapen Body, and started out by thumbnailing a non-grid layout of how I could re-draw the pages. I wasn't going to go buy pastels just for this, so I used colored pencils, and drew on some standard issue Dark Horse comic art board. I didn't have a lot of time to work on it, but I think it turned out okay, and more importantly it was interesting to get outside my normal comfort zone. I don't think working like this would work for me in general, and the effect of having an entire book of pages like this wouldn't feel right for my autobiographical comics, but it's something that'll probably sit in the back of my head and be of use somewhere down the road. It's been a busy two months, most of which I've spent finishing up the artwork for my next book with Chronicle, which should be out next year for Father's Day. It's been a lot of fun to draw, but I'm glad to have most of the pressure off for it. Meanwhile, I've been teaching a comics class at The School Of The Art Institute Of Chicago again. This past week's exercise was for the students to try and duplicate a panel from a comic, and then re-draw it again in their own styles or without trying to copy directly. 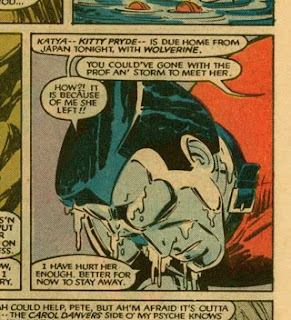 I did a quick example of this panel from Uncanny X-Men #192.